Here's how you can find and help the Wildspire Waste Palico tribe in Monster Hunter World. 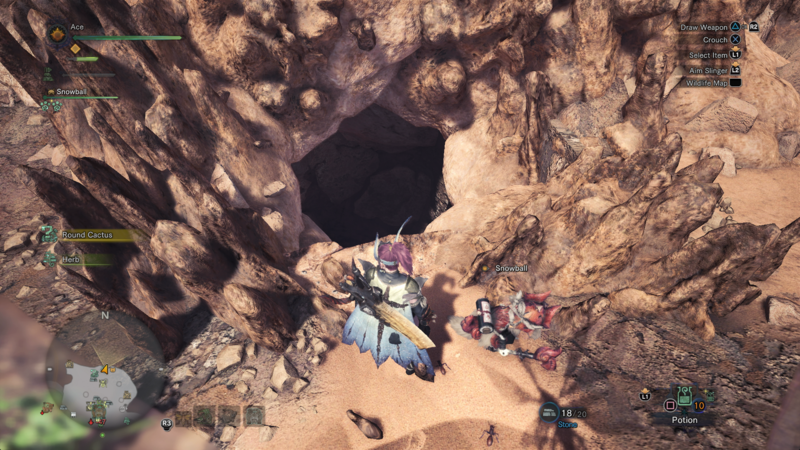 You can find Grimalkyne Tribes all over Monster Hunter World, including in the Wildspire Waste area of the game. In this Monster Hunter Wold Grimalkyne guide, we'll be guiding you through how to track down the Wildspire Waste Palico tribe, and how to help them out. To uncover the Grimalkyne Tribe hiding out in the Wildspire Waste area of Monster Hunter World, you're going to want to head to the northern reaches of the map. At the northern boundary of the map on ground level, search around the area for Doodles. Once you've filled up the tracking meter to the maximum through uncovering Doodles, you can follow the trail, which will lead you through a hole in the ground, next to a Herb. You’ll now find yourself in area 15 of the Wildspire Waste map after you’ve dropped down the hole, and if you head through a small tunnel, you’ll find yourself facing the Protector Grimalkyne Tribe, who will task you with finding and capturing three of their Protector comrades. 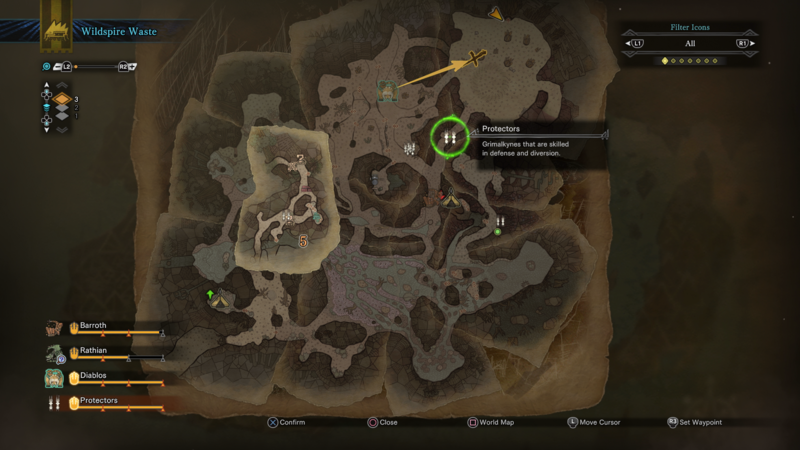 This is more simple than it sounds, as all you have to is open the map, focus on the highest level, and scour the map until you find a marker denoting a Protector Palico. Press the right analog stick in to have your Scout Flies lead you to a Protector Palico, and then equip your Capture Net on the quick item menu. When you approach the Protector Palico, hold down left trigger to aim the Capture Net at the Palico, and once the reticle turns orange, press the right trigger to fire the Capture Net and capture the Palico. 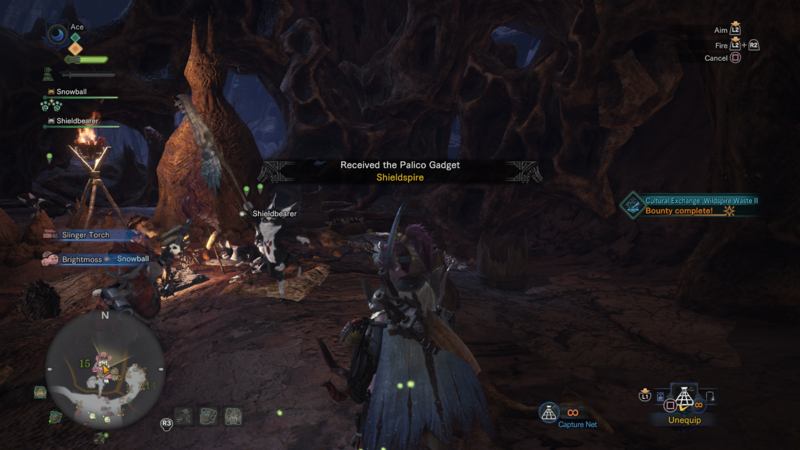 All you have to do is complete this three times with three different Protector Palicoes, and you’ll complete the quest, gaining the Shieldspire for your Palico as a reward. 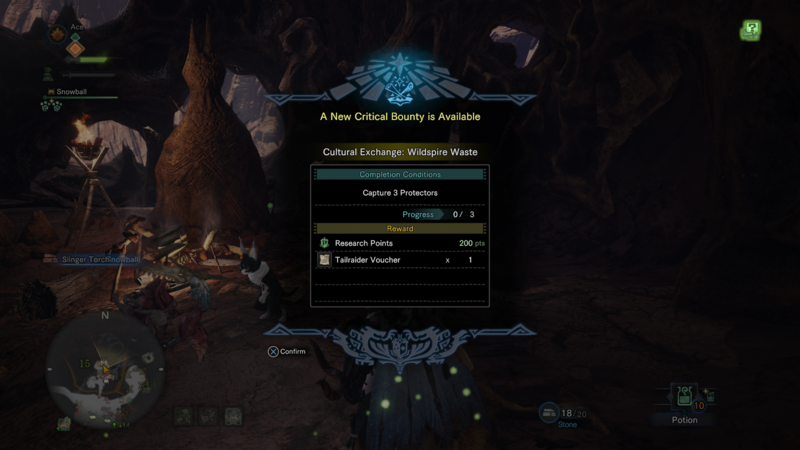 It should be noted that equipping the Ghillie Mantle for this quest actually appears to have an affect on how long you have to catch the Palicoes in your Capture Net, before they disappear down into the sand and you have to start all over again. To change the item that your Palico currently has equipped, you’ll need to head back to the Tradeyard hub area in Astera, and into your own personal room. Once you’re in here, speak to your Palico, and select the obtain to change their currently equipped gear. Select their unique gadget, and change it to the Shieldspire. The Shieldspire is actually far more useful than it first appears. Although it’s basically a massive shield for your Palico, it allows them to draw the attention of monsters that you’re fighting, meaning you’ve got more time to either heal yourself with Potions, or sharpen your weapons. This might be the end of our Wildspire Waste Grimalkyne guide, but there are still two more Palico Tribes that you’ll have to help out if you want to get your hands on the rare Plunderblade for your own Palico. Head over to our Monster Hunter World Coral Highlands Grimalkyne guide, or our Rotten Vale Grimalkyne guide, for all you need on helping out the Palico Tribe in the colorful region.